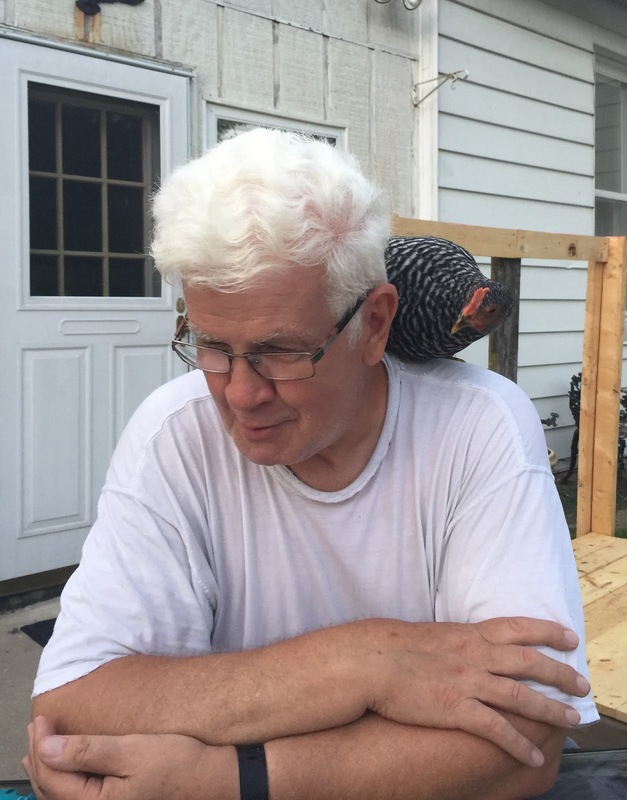 OUR NEIGHBORS, TONY and Mary Dickerman, just adopted a chicken. That's right - a real, live, clucking, soft as a baby's bottom chicken. Her name is Dorothy. They got her from another neighbor around the corner. So our Calftown alley has gone to the birds. I was driving my scooter down the alley last night when I saw Tony and Mary playing their customary Scrabble game in their backyard. There was a chicken on Tony's shoulder. What? I said, "There was a chicken on Tony's shoulder." So I had to check it out. Dorothy helping Tony play Scrabble. Dorothy eats bugs and slugs, is quite tame and gently pecks at your leg if you let her. She stays in a portable dog kennel while Tony is building a coop. The Dickermans also have two cats and Stella, the neighborhood watch dog who stands about 8 inches tall and has the attitude to go with her Alley Sheriff badge. They stay inside, and Dorothy rules the roost in the backyard. It's the perfect addition. After all, if you're gonna cluck around in Calftown, you might as well do it while your adoptive parents are playing Scrabble. Tony and Mary even put a letter holder in front of Dorothy and encouraged her to play, but all she could do was spell "Rooster" and then jump on the board and goof the whole game up. Calftown is a funny place. One block is full of trash and people who like to shoot off fireworks at 2:30 in the morning. Then there's our block, which has a variety of people of all backgrounds, and it's about the best place in town to live. Most of our block are long term homeowners and there are just a few houses that are long term rentals. We basically love our little block and our neighbors. One thing is for sure - you can't be a chicken if you want to live here. Wait a second - you CAN be a chicken! Especially if you play Scrabble. Love this, Rodney! Sounds like something my Brent would have done. Love the chicken on Tony's shoulder. Priceless.